Welcome to Toontown on Android! 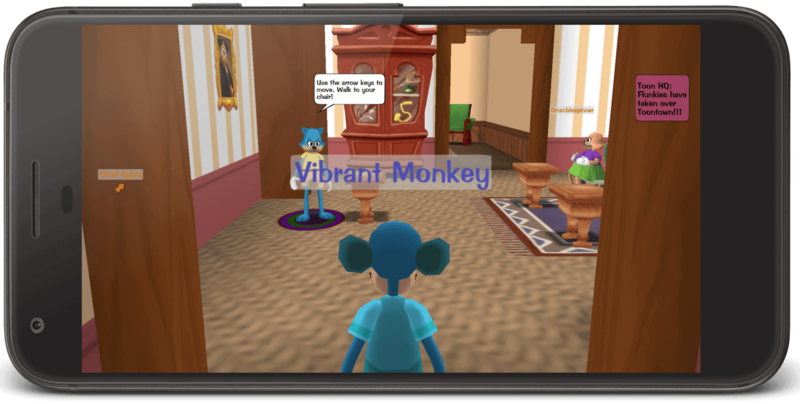 You are one of the first Toons to be able to play Toontown on your phone. The game is compatible with Android 4.0+, so every phone released after 2011 will be able to play Toontown. We recommend that you only play on phones with at least one gigabyte of RAM, as the game can, after prolonged use, utilize upwards to 700 MB of RAM, which can make Android shut the game off automatically on phones without enough RAM. If you feel like it, you can also use a Bluetooth keyboard or a physical keyboard through USB-OTG to play the game as you would on a normal PC. Finally, download the game from the Play Store. The first time you start the game, it will need to download 300 megabytes of game resources. Please make sure that you are connected to Wi-Fi or fast mobile internet, and that you have enough space on your SD card or internal storage. Thank you, and have fun!